There are many life-saving medications; but just like smokers don’t read warnings on cigarettes, many of us tend to overlook side-effects of prescription and over-the-counter drugs. Most of us will suffer aches, pains, sprains, strains, headaches, high blood pressure, arthritis, or a variety of other ailments; and every day the drug industry tells us to ask our doctors about this or that pill. What are the risks of, and alternatives to, common medications? Here are s ome answers, courtesy of the Virginia Chiropractic Association. Thanks to stringent research standards and the forward march of science drugs are getting safer, right? Wrong. The September 10 issue of Archives of Internal Medicine showed that serious reactions to common medications are actually increasing. Between 1998 and 2005 the annual number of deaths directly caused by medications increased 2.7 times. 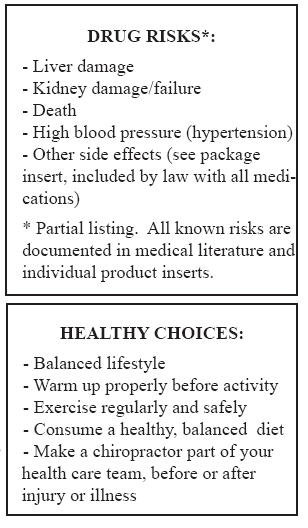 Doesn’t it concern you that some common medications come with recommendations for regular liver or kidney testing? Pain medications are a common source of adverse drug reactions. Abusing anti-inflammatory drugs called NSAIDS causes an estimated 16,500 deaths every year. Vioxx alone may have caused 27,000 deaths worldwide before it was pulled from the market, and a study published in the New England Journal of Medicine showed that the supposedly safe drug acetaminophen may cause 8-10% of all end-stage kidney failure. Anti-inflammatory medications and acetaminophen have also been linked to high blood pressure in women. So, what can you do to protect yourself and your family? Simple. First, read the package insert on every pill you consider taking. Next, remember that an ounce of prevention is worth a pound of cure. Exercise regularly in a manner that’s safe for you. Exercise has a positive effect on your immune system, your joints, your cardiovascular system… it even decreases your risk for breast, colon, and other cancers. Warm up properly before activity. A healthy, balanced diet is also critical. You really are what you eat. Here’s another secret: Chiropractic is a part of a healthy lifestyle. Recreational and professional athletes alike rely on chiropractic care to balance their frame, improve performance, recover from injury, and prevent injury. As our population ages, seniors are also realizing that chiropractic is a safe and effective way to age more gracefully. Studies have shown chiropractic to be safe and effective for arthritis management, headaches, neck pain, low back pain, and more. In a future installment of this program, we’ll talk about research that shows chiropractic has direct effects on the nervous system, and may be an effective component of managing a variety of illnesses; but wise consumers of health care know that chiropractic is more than a way to avoid disease. Doctors of chiropractic offer a path to health and our full potential.